I know, yet another Festive Flurry project, but I promise this is it for now, as I have lots of other projects to show you that feature some exciting new products. I am showing both the card & box today as I am running a bit behind in my posts. This box & card combo was our Stamp Club project this month. My aim was to feature Chalk Talk & the Tag a Boxes but in a Christmassy kind of way. 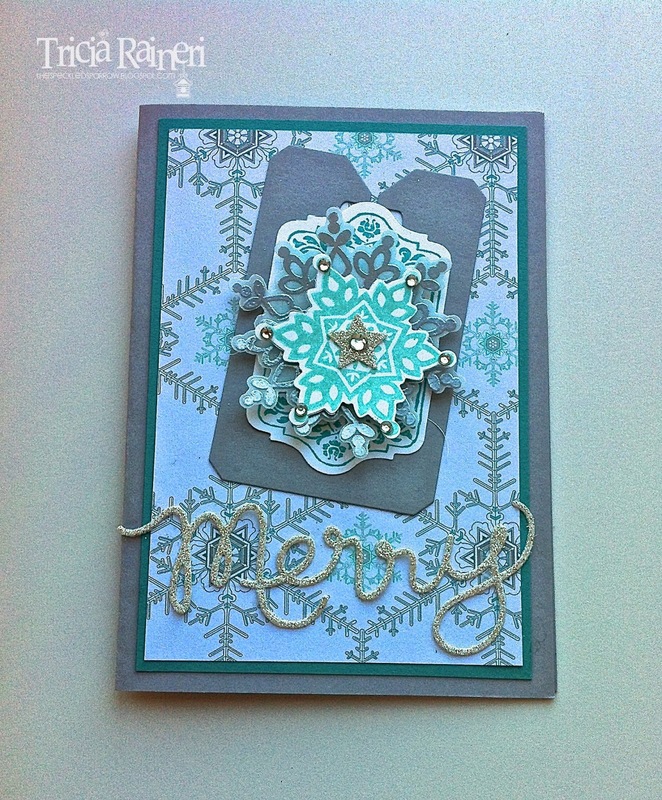 I also wanted to show off the Festive Flurry stamp set & matching framelits as I just love them. Please excuse the photos - It is a grey rainy day, & the lighting in here is pretty bad today. I used one of the new Tag a Bag Gift Boxes featured in the Annual Catalogue on page 158. (#130927) You get 8 in the packet & they come with their own acetate sleeves. These are great for little gifts & would be perfect for that Kris Kringle present we all seem to get landed with at Christmas. I used the Winter Frost DSP stack & Smokey Slate for the box. A base of Smokey Slate, a thin layer of Bermuda Bay & the matching Winter Frost paper stack were used to offset the Smokey Slate gift tag. The tag has a small Chalk Talk image plus a silver embossed vellum snowflake. Layered on this is a Coastal Cabana small snowflake embellished with with some rhinestones & a Silver Glimmer star punched from the Merry Minis Punch Pack which were carried over - Yay! I used the Expression Thinlits to cut out a Silver Glimmer Merry & phew we were all done! Paper: Whisper White (106549), Silver Glimmer (124005), Winter Frost DSP Stack (132183), Smokey Slate( 131291), Bermuda Bay (131286). Ink: VersaMark (102283), Bermuda Bay (131171), Coastal Cabana(131175). Cool Tools: Bigshot (113439), Festive Flurry Framelits (132193), Chalk Talk Framelits (129983), Magnetic Platform (130658), Expression Thinlits Dies (132171), Merry Minis Punch Pack (126882), Dimensionals (104430), Silicone Craft Sheet (127853), Silver Embossing Powder(109131), White Embossing Powder (109132), Basic Rhinestones (119246) & Hot glue gun (Non-SU).